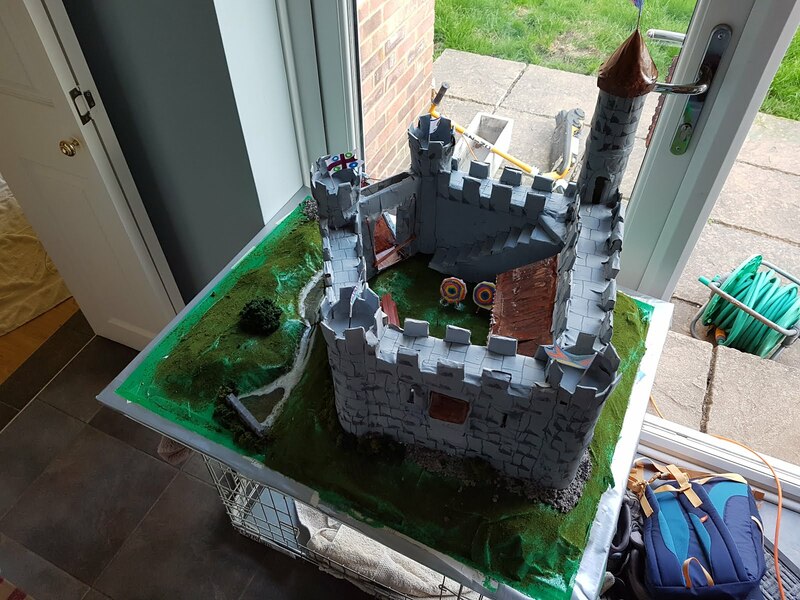 DaddyDaddyCool: Classic School Project: The Castle! Classic School Project: The Castle! It's every model-building dad's moment of crowning glory... the year 5 castle project. We've come to this moment after many years of simpler, compact, constrained project builds. Who remembers the 'Design an Olympic Torch', or 'Props for the World Book Day costume', or even as far back as the 'Easter Bonnet' of nursery years. Medieval Britain engages the children unlike possibly any other period of history. Tudors? Yawn, Egyptians? Ugh! And don't get me started on either of the world wars, the victorians or pre-history. We have, on our doorstep, castles of every era - from the deserted mounds of the mott & bailey, through to solid Norman fortifications. Climbing spiral stone staircases, shooting imaginary arrows through very real arrow slits and spotting enemies from the battlements. I don't think it's easier for a child to immerse themselves in history for any other period of Britain's past. Side note: I went to a castle in California(USA) once, it was nearly 60 years old and had wifi. It made me realise, in that underwhelming heartbeat, that British history is something to cherish, protect and create anew for future generations. So the castle build had a special meaning for me and my 3 children. It was worth 5 'extra homework' points, and we resolved to produce the best castle in the class. Deciding on what to include in your model is fairly straight forward. Take the above list and work down the must-haves. Aside from deciding on the base to use, which will determine whether a mott is possible, the optional extras can be added at the end of the build if you have some time left over. Now you'll need to decide on the scale of the castle. Considerations include how to get the castle from home to school, how much cardboard you have ready and what you want to use as a base. We used an artist canvas from Hobbycraft, which was £7 and had a fairly sturdy wooden frame. We then used a Lego man to work out the dimensions of the castle. Printing out a few images of castles, castle walls, castle features - to have handy and available to reference when designing the castle is useful. Note: we found flipping through images on an iPad each time we wanted to check what a feature looked like was slow, frustrating, and potentially ruinous to an iPad when gluey fingers were involved. 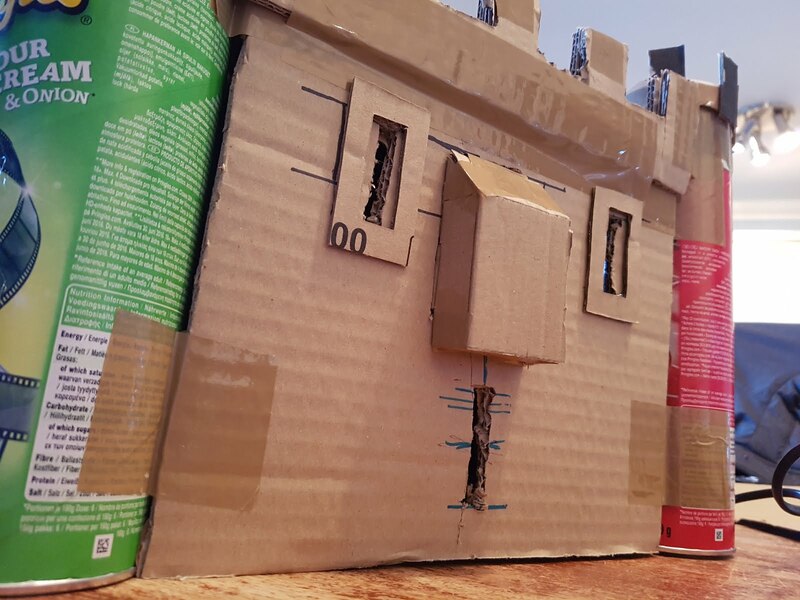 As is the tradition in our school project builds - and every other build so far - we start with a pile of cardboard boxes, of as many different shapes and sizes as possible. These would range in size and strength from thin cereal boxes to solid packing boxes that larger domestic purchases provide. All free of charge and easily collectible over the course of a few weeks of normal daily life. Make sure to hang onto empty Pringles tubes, toilet rolls and kitchen roll empties. Cylindrical structures feature prominently in castle building, providing much-needed strength to hold a structure together and repel invaders. 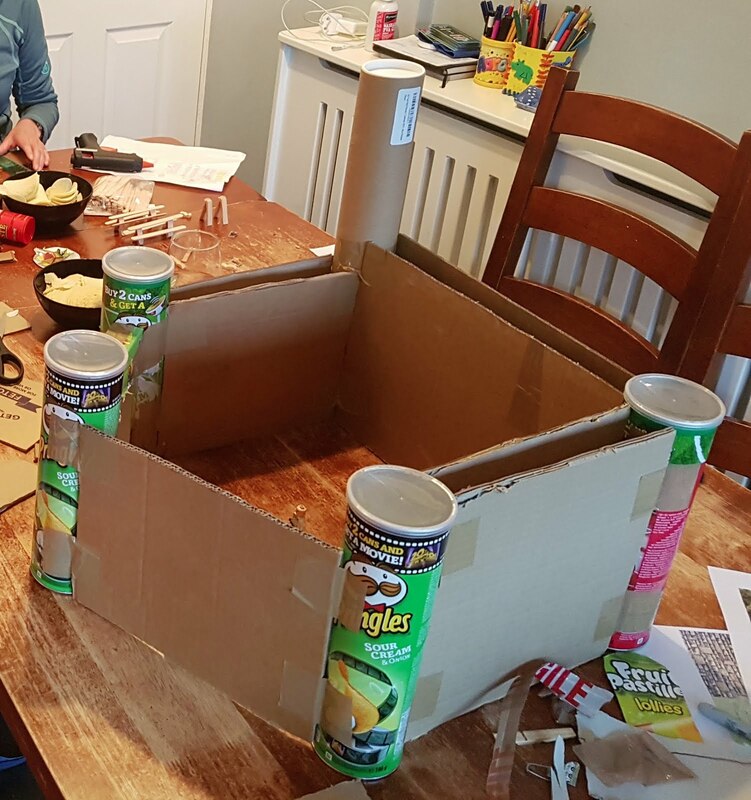 We used the Pringles boxes to layout the corners of our pentagon-shaped building. Then cut inner and outer walls from thick cardboard, and used packing tape to attach them. We had a longer cardboard tube, which made it an easy decision to add a watch-tower as one of the corners. You'll also see that both the cutting of the walls, and arranging the basic shape was done by eye without any precise measurements. I think this adds to the authenticity of the castle, as many were built around the land on which they sat, rather than designed on paper to be perfectly symmetrical and even. When building the structure, it's good to take advantage of the materials' strengths, without worrying up-front about the finished form. With the intention to use paper-mache as the final covering, we didn't have to worry about using packing tape and waxed cardboard - which are typically very difficult to paint over. We've taken this approach on most of our cardboard projects. The next step was to create the battlements. Taking the Lego man as a guide, we wanted to have a recognisable structure to the top of the castle. Here we(I) made a big mistake, which wasn't noticed until later. 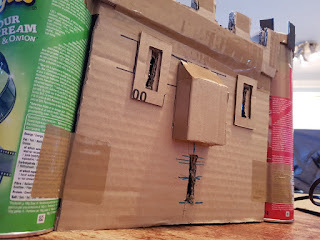 As we cut the square shape of the battlements, it made sense to bend the offcut cardboard into the centre of the wall, and to add a strip of cardboard over the top to create the walkway for archers. Only at painting time did we notice that the walkway needed to be below, and not in line with, the bottom edge of the battlements. So the walkway needed to be the height of the Leg man's legs below the battlements... whoops! But it was too close to the deadline to re-work this all round. You'll notice in the above pic that we had added the frame for the entry gate. This was created from a suitably sized single box with the archway cut into both sides. We kept the bottom of the box in tact to help with alignment and some rigidity. Into this we cut a slot in which the 'Portcullis' would slide. The Potcullis was fashioned from lollypop sticks and hot glue. My good friend Isobel, who is an accomplished Decopatch expert, was given the task and came up trumps with a highly realistic construction. A braided string pull cord was attached, to allow the potcullis to be raised. The drawbridge was added with a couple of strings attached to another stick which, when threaded through the entrance gate box would allow the drawbridge to be raised. 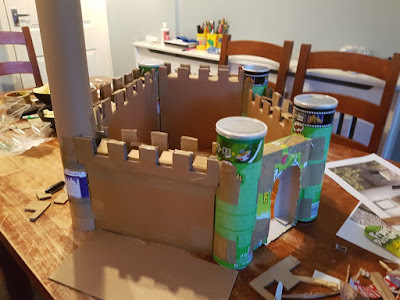 The drawbridge needed to be more rigid than our thickest cardboard, so we added more sticks to the sides and front - giving that all-important authentic wooden beamed appearance. A couple of extras were added at this stage. 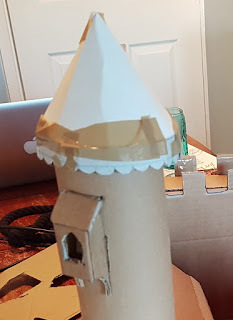 The watch tower received a roof and a 'princess parapet', which was a little too 'Disney' for my liking - but we took a vote.. and it stayed. The construction was copied from the 'Privy' construction that my daughter had pioneered earlier. You'll also see the added detail around the arrow-slits. It's important with cardboard and paper-mache modelling to add a little 'relief' to the model. This helps to bring the square cardboard to life, and allows for creases, angles and depth to added to the model. We went on to add even more rectangles of cardboard to the flat walls, to add texture and give the impression of uneven stone blocks in the walls. Inside the castle walls we added a great hall and a stone staircase to access the battlement walkway. Both of these required a little planning, and a couple of unsuccessful prototypes before we felt that the scale and size of each was just right. The great hall has a hinged roof and a cut-away front wall, to let people look inside. To add more interest to the interior of the castle, we added arched cloisters which were cut into the inner walls. It's the simple additions, or details like this which I love about modelling. We didn't plan them from the start, they just seemed like a good idea when we looked at a rather bland inside wall. This fits into the learning lesson for the kids called... "It doesn't have to be perfect at the design phase".. more latterly known in software terms as 'Agile Development' and 'Minimum Viable Product'. And now the baseboard. 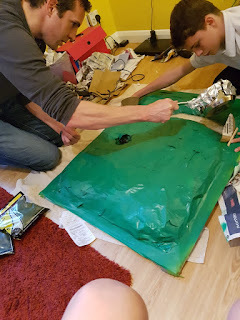 Using the time-honoured method of chicken wire and paper-mache, we fashioned a hill with a fairly flat centre area, and let the paper-mache dry. 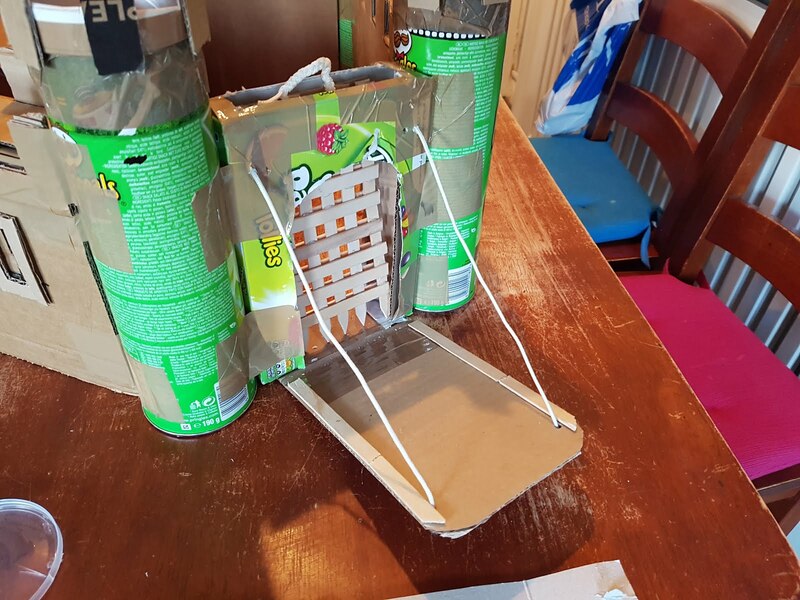 We wanted a moat, to make sense of the drawbridge, but opted for a river to save space and maximise the size of the castle. The chicken wire was held up by cut down drinks bottles underneath, and was stuffed with scrunched-up newspaper. A few layers of Duct tape held down the edges of the chicken wire, and secured the sharp edges safely. This is a job for adults, as an end of chicken wire easily draws blood if handled carelessly. The base board was then spray painted with green craft paint, ready for the final arrangement. 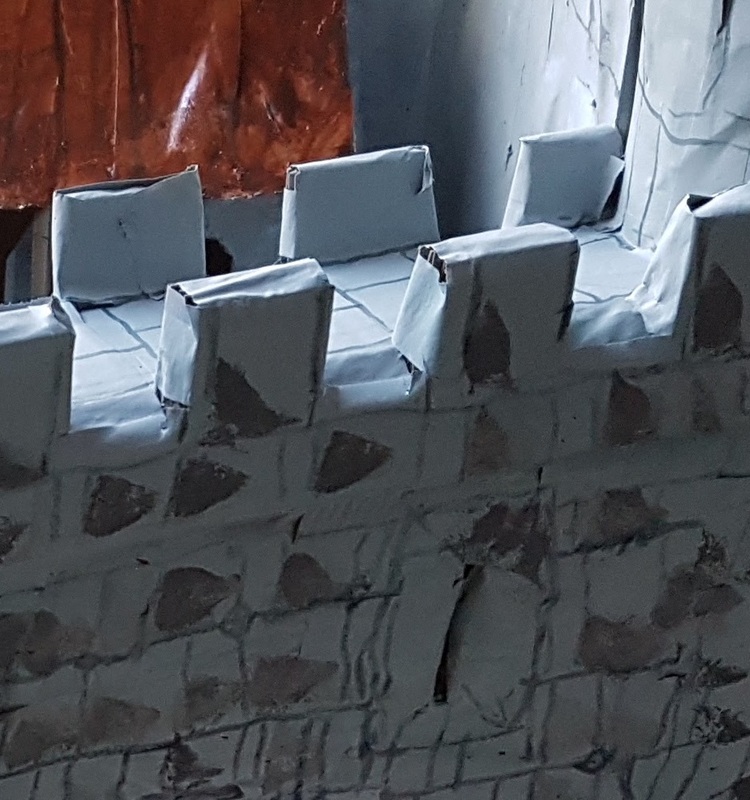 Once we were happy with the castle build, we set about paper-mache-ing the whole. This was the biggest, and most 'fun-to-boring' job of the project. Having already paper-mached the baseboard, some of the fun of gluey strips of paper had worn off. And dealing with the intricate shapes of the castle was a challenge. The children won't mind me saying that, although they put in some sterling effort before bedtime one evening, they were perhaps 25% through the task. I burnt the midnight oil to complete the job, whilst 'improving' some of the work they had already done. After a couple of days to let the full, and rather wet model dry out, it was time to paint again. Spray paint is your friend for easy coverage of large and complicated models. While the castle paint dried out we set about adding some interest to the baseboard. I wanted the river to be as realistic as possible. Just painting the bottom blue wouldn't have kept me happy, so we invested in something that I previously didn't realise exists... "Realistic water". A favourite among model rail enthusiasts, who hanker for a village pond diorama. It comes in granular form, and simply needs heating up in a temporary saucepan. When heated enough it becomes a gloopy liquid which can be poured into any concave space, wherein it solidifies and looks remarkably water-like. You can even add ripples by using a similar fake water product on top. One cautionary note here... you will throw away any saucepan that you use for this, as the 'water' sets like concrete almost immediately on whatever receptacle you use. We are one saucepan light in the kitchen now. 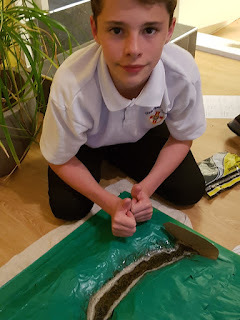 Having 'damned' the ends of our river bed and added some modelling gravel, we poured in the melted water mixture. Although the mix reacted with the gravel and frothed a little, it settled quite nicely into a flat moat-like form. One end of the river fell away from the relief of the land, so couldn't contain the fake water. So again, as an 'on-the-spot' decision we decided on building a wooden damn as a point of interest for the model. The next job was to paint the castle. 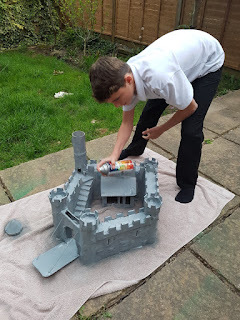 With a variety of shades of grey and grey-brown paint, the castle began to come to life. We used thin permanent markers to draw the outline of the stone wall blocks and then cut foam sponges to print light-shading onto each stone. I think it came out quite well - from a distance it's quite effective. Up close it's a bit rough and ready. We used an old tin of garden furniture paint for the drawbridge and great hall roof. I liked how it looks, but it did kill a few paint brushed and one t-shirt when a bowl of the paint tipped over. With the baseboard and the castle ready, it was time to join the two parts. 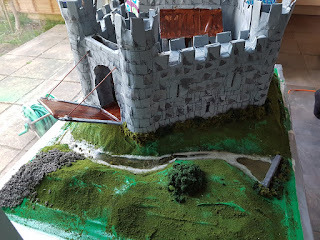 I used a combination of hot glue and PVA to seat the castle on the board. We then had to add some fake grass, stuck down with spray glue. It turned out that the green craft paint that we sprayed on the base-board was a little too shiny and luminous, and anywhere the fake grass (which you sprinkle on from a height) wasn't thick, the green paint looked odd. But on school projects, you need some non-perfect aspects - both as learning lessons for next time, but also to make sure the child presenting the model can discuss how he/she might have improved the model along the way. 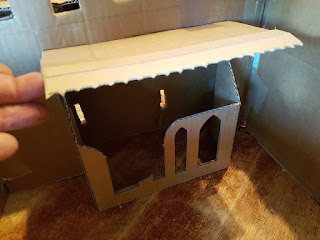 Another note to mention here is that the child presenting the model in class needs to have been 100% involved in all stages and aspects of the construction. This may mean that, in this case, my son did anywhere between 10% and 100% of the work at each stage. But that he could accurately describe what was done, how it was done, and how we decided to do each stage. He also had to give full credit to his helpers, and indicate truthfully how much help others had given him along the way. I see this not as a cop-out, to explain a glorious model that 'Daddy made', but a vital life skill - to own a project, make decisions on that project, and use the resources (both materials and people) to complete the project to a high standard. The usefulness of this skill is as relevant for tomorrow's workforce as is the skill of individual/solo production. So with the castle and baseboard conjoined and the grass and other scenery added, a couple of final touches were needed to bring the whole piece together. Fake bushes were added along with a mix of PVA glue and fake gravel, around the base of the castle. This helps the castle not look as if it were plonked on top of the board, but had grown up from it. And everyone knows that castle walls have boulders and bushes at the bottom, from previous sieges and for baddies to hide in, respectively. We added archery targets, a table in the great hall, and a dungeon sunk into the centre of the courtyard. Add a few flags, designed by each helper on the project, and there you have it. A rather special and memorable castle build. The presentation of the castle to school the next day was met with awe and wonder from the other children. 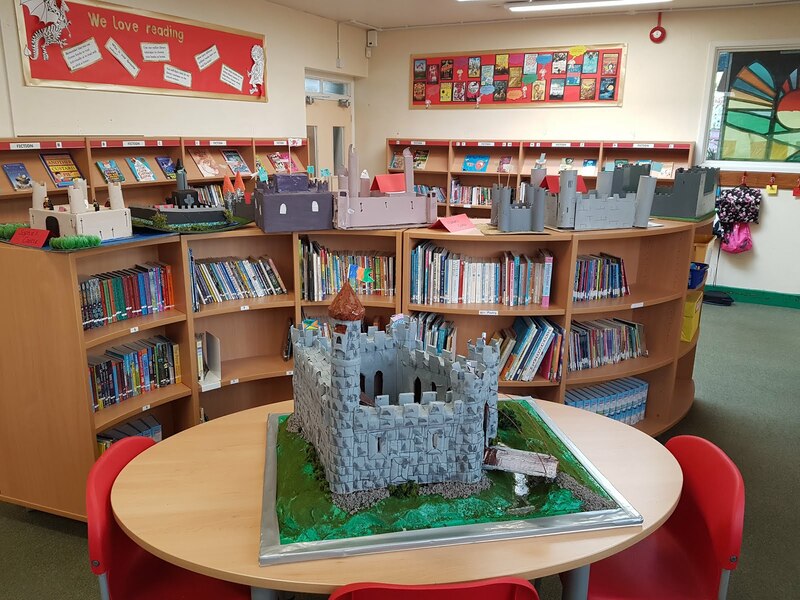 A very proud 10 year old went on to describe his and our efforts, and the castle took pride of place in an exhibition at the parent's evening a few days later. It's fun and rewarding to spend a lot of time together as a family, to deliver a result like this. It distracted all of us from gaming consoles and TV for the best part of two weeks. This build will go down in our memories as the best project yet... until the next one. And my proud 10 year old received double points for this 'piece of homework'. 10 points, in the bag. Hiya, love this idea. Ive to always do a castle with my little boy. 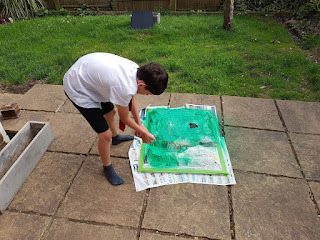 Can i ask how long did the paper mache hill take to dry? Hi Dawn. With two or three layers of paper maché, You can expect 36-48 hours for it to dry completely - indoors in summer or with central heating. If you're doing it in a shed or garage, a little longer. The project took about a week to complete, with a good few sittings of an hour or so.